Real Estate News - October 2017 Sales exceed historical expectations! 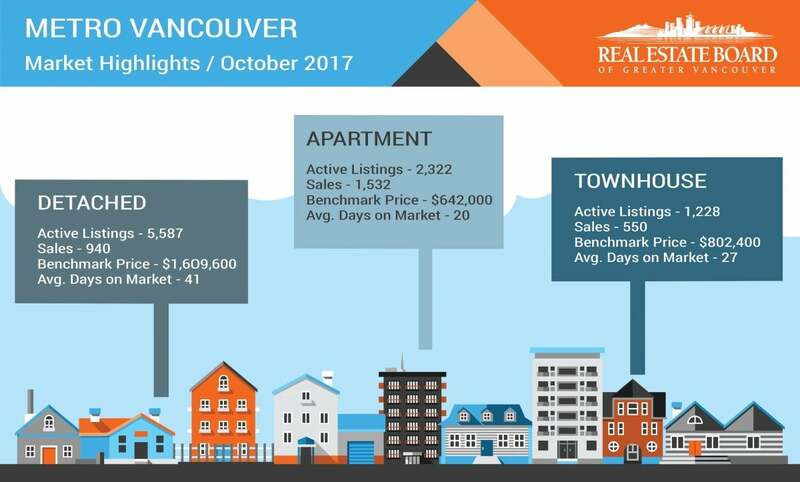 The Real Estate Board of Greater Vancouver (REBGV) reports that residential property sales in the region totalled 3,022 in October 2017, a 35.3 per cent increase from the 2,233 sales recorded in October 2016, and an increase of 7.1 per cent compared to September 2017 when 2,821 homes sold.Last month’s sales were 15 per cent above the 10-year October sales average. "Conditions continue to vary significantly based on property type. The detached home market is well supplied with homes for sale, which is relieving pressure on prices," Jill Oudil, REBGV president said. "It remains a much different story in the townhouse and apartment markets. Buyers of these properties continue to have limited supply to choose from and are seeing upward pressure on prices. "There were 4,539 detached, attached and apartment properties newly listed for sale on the Multiple Listing Service® (MLS®) in Metro Vancouver in October 2017. This represents a 14 per cent increase compared to the 3,981 homes listed in October 2016 and a 15.6 per cent decrease compared to September 2017 when 5,375 homes were listed.The total number of properties currently listed for sale on the MLS® system in Metro Vancouver is 9,137, a 0.1 per cent decrease compared to October 2016 (9,143) and a 3.5 per cent decrease compared to September 2017 (9,466).For all property types, the sales-to-active listings ratio for October 2017 is 33.1 per cent. By property type, the ratio is 16.8 per cent for detached homes, 44.8 per cent for townhomes, and 66 per cent for condominiums.Generally, analysts say that downward pressure on home prices occurs when the ratio dips below the 12 per cent mark for a sustained period, while home prices often experience upward pressure when it surpasses 20 per cent over several months. "The growth in our provincial economy and job market is contributing to today's demand," Oudil said. "The federal government's announcement of plans to tighten mortgage requirements for the seventh time in the last eight years also helped spur activity in the short term. Many buyers are trying to enter the market before the changes are in place. "The MLS® Home Price Index composite benchmark price for all residential properties in Metro Vancouver is currently $1,042,300. This represents a 12.4 per cent increase over October 2016 and a 0.5 per cent increase compared to September 2017.Sales of detached properties in October 2017 reached 940, a 44.2 per cent increase from the 652 detached sales recorded in October 2016 and a 34.6 per cent decrease from the 1,437 sales in October 2015. The benchmark price for detached properties is $1,609,600. This represents a four per cent increase from October 2016 and a 0.5 per cent decrease compared to September 2017.Sales of apartment properties reached 1,532 in October 2017, a 30.1 per cent increase compared to the 1,178 sales in October 2016 and a 0.7 per cent decrease from the 1,543 sales in October 2015. The benchmark price of an apartment property is $642,000. This represents a 22.7 per cent increase from October 2016 and a one per cent increase compared to September 2017.Attached property sales in October 2017 totalled 550, a 36.5 per cent increase compared to the 403 sales in October 2016 and a 17.4 per cent decrease from the 666 sales in October 2015. The benchmark price of an attached unit is $802,400. This represents a 17.7 per cent increase from October 2016 and a two per cent increase compared to September 2017.